Hot on the heels of LG's teaser for MWC 2013, Taiwanese firm Asus has released a fairly bonkers video to get you in the mood for the Barcelona event. 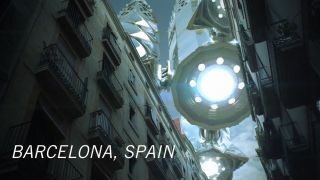 In the video we see an alien invasion sweep over the Catalonian city, with the shiny metallic spaceship landing on the famous Sagrada Familia church. A crazed onlooker (read: bad actor) in the video declares, "Wait! Is that a metallic object flying across the sky? It's landing... it's docked into the church! ", as the message "ultimate craftsmanship, today" resonates on screen. It all seems a bit much and Asus leaves us pondering a request at the end of the bizarre teaser: "Join Asus to embrace the metallic miracle." What does this all mean? Well hopefully it's not the end of the world and merely the fact Asus has a lovely, fully metallic tablet or smartphone ready to delight us. Now we're not afraid of an Independence Day style attack here at TechRadar, so we're taking it upon ourselves to indeed join Asus in Barcelona and find out what the hell it's talking about. Expect to hear us muttering "everyone's trying to get out of Barcelona, and we're the only schmucks trying to get in" sometime next week (and if this is lost on you, then you need to go and watch Independence Day stat).